The pediatric ophthalmology department at The Krieger Eye Institute, led by Dr. Michael Altman, provides eye health services to children ages newborn to 16. We offer a wide range of ophthalmic services -- from treating diseases of the eye and neurological problems to prescribing eyeglasses. Also called "lazy eye," Amblyopia is a disorder in which there is decreased eyesight in one or both eyes due to abnormal development of vision during infancy or childhood years. This disorder is characterized by the eye and the brain not working together properly; the eye may look normal, but there are vision problems because the brain is favoring the other eye. In some cases, amblyopia can affect both eyes. It can also occurs in people who have crossed eyes (misalignment) or a significant difference in the degree of nearsightedness or farsightedness between the eyes. Also called "crossed eyes," strabismus is a condition in which both eyes do not look in the same direction simultaneously, usually occurring in people who have poor eye muscle control or are farsighted. With strabismus, one eye may look straight ahead while the other eye is turned inward, outward, upward or downward. Strabismus usually develops in infants and young children, often by age 3. A cataract is a clouding of the eye's normally clear lens that can interfere with vision. 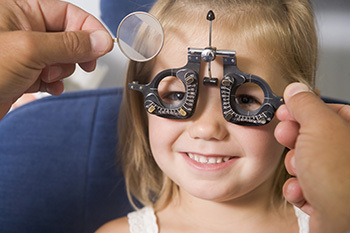 Cataracts usually develop in people over the age of 55, but occasionally develop in infants or young children. Depending on the severity of the problem, treatment may vary from glasses and contact lenses to surgery. Ptosis is a drooping of the upper eyelid. In some cases, the droopy lid can act as an occluder, thereby preventing healthy development of vision. The ophthalmologist must carefully consider whether surgery is required. Physicians at The Krieger Eye Institute are experts in ophthalmology as well as other specialized fields. Using the most advanced technology available, they work together to provide comprehensive eye care of the highest quality.